It was just a pub meal: a group of colleagues dining together, along with two of their partners and a couple of friends. Norwich fans who saw the happy group at the big table at The Crabtree, in Fulham on Saturday night, took very little notice. But every Fulham supporter who walked past did a double-take. Beer was spilled as astonishment stopped them in their tracks. Delia Smith and Michael Wynn Jones, City’s majority shareholders, were enjoying pub grub with a group which included managing director Steve Stone, sporting director Stuart Webber, finance director Ben Dack and director Tom Smith. If you take the Rob Butler view — that my opinions and inside-knowledge can be dismissed because I’m too close to the Norwich City board — well, read something else. I’m weary of being confronted about friendships for which I refuse to apologise. If you’ve got an open mind about the club we all care about, you might share my belief that there was a real significance in the reaction of the rival sets of fans to the table of diners at The Crabtree. Seeing Delia, Michael and the rest was no big deal for Norwich supporters. They are used to the idea that their club’s decision-makers join them in pubs before or after games several times a season. Many of them know how much the heads of the City hierarchy have taken the admirable Norwich City Fans Social Club to their hearts. Delia was cajoled into playing a game of Giant Jenga at one NCFSC gathering, Tom and his wife, Alice, are regulars at NCFSC quiz nights. Stuart and Steve — the newish key personnel at our club — have been to an informal NCFSC night and taken part in a discussion forum at another NCFSC event. At Fulham on Saturday, the group of City people with a table booked at The Crabtree said their goodbyes at Craven Cottage as early as politeness allowed and strolled to the pub 40 minutes or so before the table was due to be ready. As is always the case on matchdays, The Crabtree was heaving. Stuart kept slipping away to make and take calls on his mobile — there was work to be done — but Delia and the others were perfectly happy to just stand and chat to anyone who wanted to natter. It was a completely unremarkable scene — if you are a Norwich City follower. After all, why shouldn’t directors mix with paying punters? But as I saw one Fulham fan after another nudge a mate and point in wonder at our club’s owners I was struck by a thought. In 40 years of writing and broadcasting about football, during which I worked at games in four continents, I never saw this sort of thing happen with the kingpins of any club other than Norwich. I can recall a few occasions when nervous chairmen held uneasy talks with fans groups. I can think of club owners whose security details might let a token supporter through now and then. But directors ambling into a pub for a chinwag after a game? Nah. It’s a Norwich thing. It’s a Delia and Michael thing. It’s a blooming fine thing. It also says a lot about the Webberlution. Let me explain. It was Delia, in particular, who was determined that there should be a complete reorganisation of the club’s structure after Jez Moxey was given his P45. Some around the boardroom table voiced caution and Delia usually accepts the majority view. But this time she said, “It’s my name the fans shout when things go wrong. They chant, ‘Delia, Delia, sort it out’. So I am going to. I have to”. That determination was driven by hurt she felt that club staff had become fearful and unhappy in recent years. So she got all the staff together and told them she was going to change things — that good people on the payroll would be empowered rather than cowed. Moxey’s appointment had been overseen by head-hunters. So the board already had a detailed list of other potential chief executives but had already discounted everyone once. On the other hand, there was the capable and popular Steve Stone. He had showed he could lead the business side of the club with aplomb but admitted he had limited experience of football. Thus the idea of splitting the business and the football into separate “silos” was born. And among the key criteria for the a sporting director was that he should get on well with Steve. There could be no more “them and us” attitudes in the relationships between Colney and Carrow Road. So Stuart’s final interview for his critical job wasn’t an interview at all. It was a couple of days spent with Steve to see if they could work together. Next, Joe Ferrari, the Head of Communications, who definitely bleeds yellow and green, set about opening new channels with fans groups and blog sites and everywhere you looked you could see a coming together, a repairing of the Norwich City community. And at a pub on the bank of the Thames on Saturday, I watched as Stuart, Steve, Ben, Tom, Delia and Michael laughed and joked at the heart of that community. I finished editing volume three of Tales From The City this week. In the very first chapter Simon Lappin talks about the surge up the divisions under Paul Lambert, and says this, “It felt that the whole club, the whole city and all of Norfolk were part of the same incredible mission”. At Fulham, in The Crabtree, it felt that we were, at the very least, all on the same side again. There will be disappointments and perhaps some despair this season. It’s football, after all. But I haven’t felt so positive for a long time. Which brings me back to dear old Rob Butler. After the pre-season victory at Charlton, BBC Rob said on Twitter, “Quite why Alex Neil didn’t pick Maddison is beyond me. Could have saved the fella his job.” At roughly the same time, another Norwich fan said to me, “Looks like sending Maddison out on loan has done the trick”. All opinions about Norwich are valid, but the first instinct of some is to see a flaw, to carp and quibble. Others always see a positive. It’s the old glass half full or half empty conflict. As I saw beer spilled in The Crabtree by startled Fulham fans, my glass, as usual, was definitely half full. Very well said Mick, if only more people could be so understanding. Mick, Stewart has been telling us that Tom and Steve were demanding a new structure. Now you say Delia. With no MD at the time, that leaves very few dissenting voices. Can you clear up who was for and against it? Does this really matter David? What ultimately counts is that it was recognised that a problem existed and steps were taken to resolve it, rather than maintain the status quo. It’s important enough for Mick to have written an article on it. I think accuracy is important. We’ve had the same story used to promote Delia, Tom, and Steve. Something doesn’t sound right to me. I don’t see why this can’t be cleared up. The moment I’m writing about was before Steve’s appointment. I guess I don’t understand. You say it was “Delia in particular” who made the change. Steve stone was acting MD and Tom was on the board at that point. Can you confirm they weren’t the catalysts. We keep being told Toms value was his pushing for change. When you’re saying it was Delia. I don’t understand where this opposition is that everyone is fighting against. That’s a fantastic piece of writing Mick, and obviously from the heart. You must have known Delia and the rest for a lot of time now and you appear to have the utmost respect for them and friendship with them. Fair play to you. I do not take the Rob Butler view – indeed I find some of his performances abrasive almost to the point of offence when he winds up some of his callers to make themselves appear even dafter than they doubtless might be – I love NCFC as much as the rest of us who read and write for MFW and my mind is always, hopefully, open. I could not give the Board more credit for what they have done with implementing the new structure, as much as I have criticised them in the past for sitting on their collective hands when a decision needed to be made. Just now I feel as positive as you do and I am really looking forward to watching our season develop. However, should Stuart Webber depart suddenly for any reason, I fear we would be back to square one. He is our key figure, not an admirably gregarious and sociable Board with limited financial resources in these days of money calling the footballing tune.. Cheers for the insight Mick. And whilst you were doing that we were part of a joyous throng of City fans spreading the Nelson chant along the District Line back through Notting Hill Gate station and onto the Central Line; to the bemusement of Londoners, tourists and fellow travellers alike. A great feeling. Fair play to the directors who drove the change that this club badly needed but my criticism has always been why it takes such a long-time for the club to make the big calls. I’m not advocating rushing into everything but it does seem we have to hit a real-low before decisive action is taken. 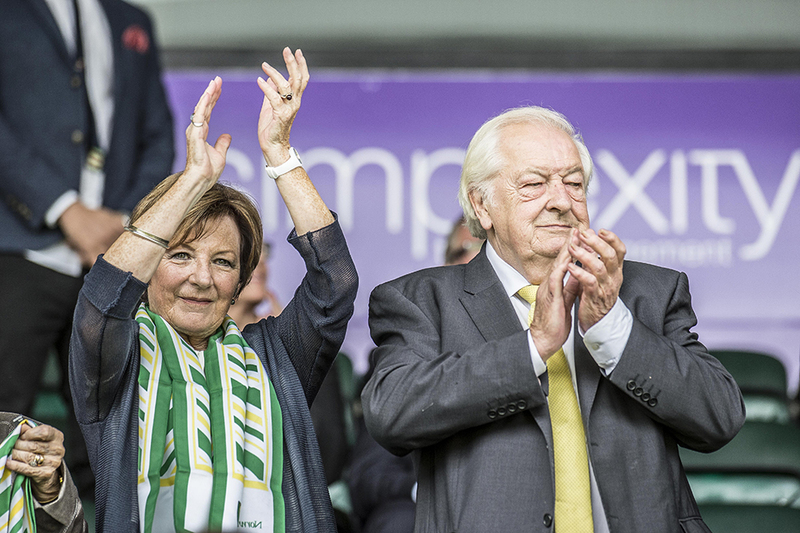 Delia and Michael have done a lot of good for the club. However, they have not been able to succeed in making us an established Premier League team in 21 years which is a failure on their part. I do love their passion for the club and we do have better owners than a lot of similar sized and even bigger clubs. I don’t think it is Delia’s and Michael’s role to make as an established Premier League team. That’s the responsibility of the manager – now Sporting Director and head coach. What Delia and Michael have done, in spit of the obstacles, is make us a sustainable club capable of at least challenging to go up to the Premier League on a regular basis, even when not in it. This compares with Ipswich for example, who supposedly have a wealthier owner than we do. Personally, I do not want us to be bought out by some unknown foreign owner, and there are many things I care about more in respect of our club than success at any cost. We are not sustainable. Hence why we’re selling players. Great article Mick and well said. There definitely seems a new energy associated with Norwich this season and the togetherness of the club and supporters is key to this. We succeed or fail together as a club. An interesting aside to this is the NO issue. Perhaps this is being blown out of all proportions but I can’t help but feel that his apparent attitude is everything the club is against and trying to move away from. Not just at a team level but the whole club being united, together. It will be certainly interesting how this issue resolves itself but so far I have been really impressed with how Daniel Farke has handled it. Personally, I give NO the benefit of the doubt (heat of the moment reaction) but no doubt he has crossed the line which has wrangled with DF and maybe team mates too. A very good article spoilt by petty vendettas. Such a shame. Bob, I don’t think there was anything petty in Mick’s article, honestly. Try listening to CanaryCall on the wrong night in the wrong light and I’m sure you’ll understand where he’s coming from. It ain’t always totally pleasant. Nice bonus as it is, I suspect the vast, vast majority of fans couldn’t give two hoots whether the board mix with the fans in a pub before or after the game but would prefer to have a successful team in the premier league. You talk almost as if we should be grateful that the likes of Tom and Alice deign to talk to fans at the occasional quiz night? Its great that the board are nice people and are accessible but all too often this club loses sight of the main aim of a football club. Had they not done that when Alex Neil (and completely ignored their fans to the massive detriment of the club) we might still be in the premier league rather than launching a desperate, “face saving” restructuring exercise which may well be too little, too late. Butler was right about Maddison. lets not retrospectively try and make that out to be some kind of masterstroke by Neil. On that basis, Jim, I’m one of your (perceived) tiny minority of fans who do care that the board ‘deigns’ to mix with fans in a pub. It’s right and proper in any organisation for the board to communicate rehularly face to face with both staff and customers. Not quite sure why you describe the restructuring as ‘face-saving’, but I guess some folk are just naturally suspicious of any positive moves that they are not directly involved in, and therefore do not necessarily comprehend. You also say that they ‘ignored’ the fans. I guess by that, you mean they didn’t do what you wanted, when you wanted. That doesn’t mean they didn’t listen, it just means they exercised common sense. I want my club to maximise it’s potential on the pitch and whether I can meet the board in a pub or not, matters not one jot. I feel for too long things have been badly run (scouting, recruitment, hanging on to a manager clearly out of their depth etc) and believe we could have also found investment like the likes of Bournemouth etc. Good read, afraid Rob Butler likes the sound of his own voice too much, when he doesn’t agree he tries to shout people down. Short, sweet and spot on. Great post. Why is attacking a fellow City fan for their opinion a great post? I didn’t mean it like that. Not all City fans frequent the airwaves with a licence to influence others. Stephen made a non-directly football related point I happened to agree with. If somebody says a third party likes the sound of their own voice and I agree with that sentiment, then I can rate it as a a great post. Especially if I think Stephen speaks with truth and reason. If you enjoy Rob Butler’s contribution to Radio Norfolk, continue to do so. It’s a free country (just) and as you so rightly say, we are all fellow City fans. Pity you seem to be getting so personal about Rob Butler and anyone who has views outside of yours and the boards. Rob speaks a lot of sense & although he is not alway right he has as much right & probably as much knowledge on the players & situations as you. I am 100% a City fan but it seems these days that having a view outside of the inner circle, is to be viewed as a traitor or someone who just does not understand. I believe we have wasted a golden opportunity to build on what the Lambert years gave us & it is 100% the fault of the board. As Charlie Wyett recently intimated… its all getting a bit “North Korean” amongst some of our support. This is my club, Robs club as much as yours… Here’s to a successful season & lets hope Farke can work wonders with a much reduced budget & player quality. There has been many many times when Rob Butler has provided me entertainment when there has been none to be had on the pitch. I believe Rob to be fair and impartial. When things are going well, he points it out, when things are going poorly he points it out. Unlike others who seem to find a way to support the board regardless of what’s happening on the pitch. When time and time again the best action Delia and Michael take is admitting they don’t know how to run a football club, perhaps they shouldn’t be owners of a football club. A typical Mick Dennis propaganda piece on the Norwich City owners and board. Some of us actually respect and like the owners without having to have it rammed down our throats. And the piece about Rob Butler was narcissism at it’s finest; childish drivel. Mick always talks about Delia and Co. as if they are royalty. They are his friends and he clearly believes what he writes. However, we cannot lose sight of the fact that they were also responsible for the Alex Neil debacle and its financial implications. Had they removed him in January 2015 when he was wallowing out of his depth ( as many of us called for) I firmly believe that the club would still be in the premiership. I will back this new administration all the way as I believe we are now going in the right direction but as someone above said – what would happen if a big fish moved for Webber or indeed Maddison? I also believed the PR(?) that young Mr Smith was the driving force behind the changes and was pleased to hear it. A well written piece indeed but, other than about Rob Butler, forgive me if I take a slightly different view. Can’t argue with any of that. Well said, Cyprus. I sincerely hope the Neil debacle taught “them” a lesson. From what I’ve seen, it seems to have done, so far at least. I doubt the changes are solely down to young Mr Smith. I suspect an older hand with a knowledge of politics may well have had something of an input. Outdated owners who are about 15 years past their sell-by date. We will slowly slip down the leagues while they cling on to what is a lifestyle they can’t bear to let go, but can’t actually afford to live. All the while they are indulged by an array of sycophants, all with their noses in the fan-funded trough, to one degree or another. Their appalling views, as laid bare in the Times last year, were the final straw for me. The poster formally known as Jeff? Great comment i look forward to you taking over the club putting your money in and changing things for the better. I wait with excited anticipation fantastic things just round the corner. Sadly the club is not up for sale and is being handed over to their nephew, whose only business experience is a failed photo start-up. Sorry if I got your hopes up. Agree with many others on here – I am far more interested in the questionable competence of the Board and their devotion to failing managers than I am about where they dine on a Saturday night. Seems some of the commenters have a gripe with Mick’s article, I personally think it was an enjoyable read and that is all Mick is I hope just trying to inform people in what he knows, has seen and give city fans an insight on the owners, and his opinion on Rob Butler. In reading the article I find no reason not to take the article in the way it was intended as banter from an MFW contributor and city supporter and replying to it with venom, and insulting remarks unnecessary. We all have opinions that other don’t agree with lets just say we agree to disagree and hopefully no one gets over heated by the articles. Mick frequently in his tweets calls for people not to get personal & to behave correctly… just pointing out that he does not seem to be following his own advice when he gets unduly sarcastic & in my opinion, belittling towards a fellow City supporter with different views. Another fawning piece from Mick, extolling the virtues of this highly flawed board. Sorry but can’t yet forgive them for past incompetences. Hope Mr Webber is the magic bullet the club needs but it really is early days yet. OTBC! I have a lot of sympathy with the view that the most important measure of a Board is its competence. I suspect Mick would too. I’ve less sympathy with the unspoken view of some commenters that Norwich has some natural right to be an established Premier League club. For the first decade I supported City we were mid-table in Division 2 (now the `Championship); until Ron Saunders came along, we never expected to be anywhere else. It’s easy to come up with criticism of the Board under Delia & Michael – as it is for every Board in football. I’d argue that we’ve had far more good than bad from them – including the recent re-structure, to scepticism from radio pundits and tut-tutting from our illustrious neighbours down the road . But the point of Mick’s piece is surely something different. All other things being equal, is it good to have accessible owners who actually support the club? You bet it is. Thank you for that article Mick. I think that Diane’s comment “Reading that has made me feel very emotional, well said Mick” just about sums it up for me too. I also think that Stewart Lewis is spot on! I remember the Ron Saunders days – and for some fans to think that it is Norwich’s inherent right to be in the Premiership then unfortunately they are deluded – whilst I admire the Green and Yellow passion, it needs to be tempered with a bit of realism. There are 20 teams in the Premiership who think it is their inherent right to be there as well as a goodly percentage of Championship teams who also feel the same way. To chastise and castigate our owners for not doing more to get us to the Premiership is nonsensical. Those criticisms sound like the “self professed entitlements” of certain Leeds & 1p5wich supporters. Maddison was only on loan for half a season. Alex Neil could have picked him in the 2nd half! Both are right, the loan helped and Maddison is capable of changing games. He might not have been able to affect our leaky defence though. Stewart – I don’t think there are many fans who feel a natural right to be a Premier League club. And if it is “unspoken” how do we know? But we expect that what the Board lack in providing any personal investment can be helped by using income cleverly, and recruitment in the past few years has been very very poor. The Board seem to be less visible when times are difficult,…. and they certainly ignored the vast majority of fans who wanted Alex Neil sacked for a good 6 months before they eventually reluctantly fired him. Matt: we’ve spent half of recent seasons in the Premier League, despite being theoretically less resourced to do so than many other clubs. The reaction of some fans: our Board is “incompetent”, “15 years past their sell-by date” and worse. The sense of entitlement – from quite a few fans, though not the majority – is palpable. No-one could deny the Board have made mistakes. Unlike our friends down the road, though, we seem to be able to acknowledge it and change course. I see the issue as fairly clear; 1) We want to establish ourselves as a Premier Club. 2) In order to achieve 1) we need money and plenty of it. 3) Delia and co do not have the money needed to achieve 1). 3) Delia will not sell our club. That all means that, because Delia will not sell up (passing it to another family member will change nothing) we are condemned to a life in the Championship at best. Surely it cannot be right for Delia to condemn our club in such a way. By the way, with professional due diligence, we CAN sell to an investor who can take City on to levels that Delia can only dream about.